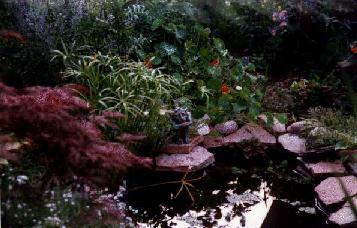 Welcome to the Garden Pond! 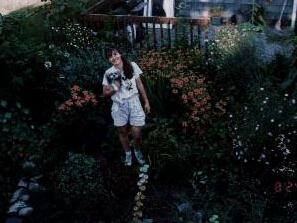 This page depicts our garden from this past summer of 1996. 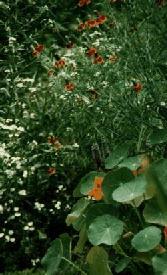 We planted many more flowers, identified some mysterious ones and were surprised by some unexpected returns from last summer. We removed the old cracked cement sidewalk and put down a new cement path made with a path template to simulate flagstone. The space between the stones is filled with sand and parts of it have pennyroyal growing in between. We are lining the path with herbs on the vegetable side. This spring we will paint the garage a more receding color. We also look forward to apples and grapes. We get lots of raspberries from our raspberry bush and enjoy planting patches of multi-head sunflowers. Enjoy the pictures! 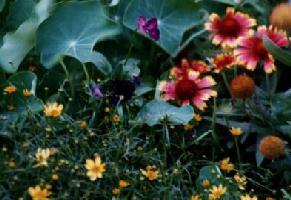 Spring '96 brought forth a fresh display of our plants. 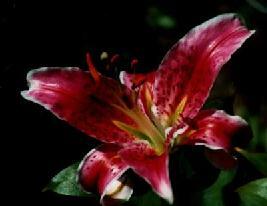 Bulbs planted last year dazzled us with brilliant displays of color. 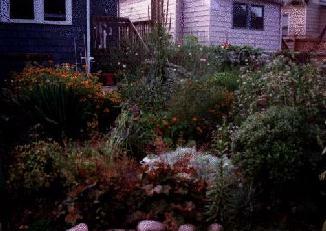 By midsummer, our yard was quite full and beautiful. 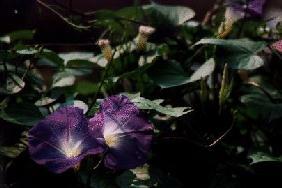 Every morning, the morning glory blossoms showed beautifully. 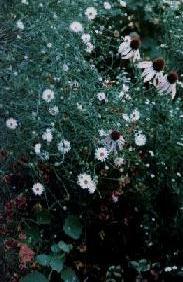 The cornflowers look over their surrounding companions. 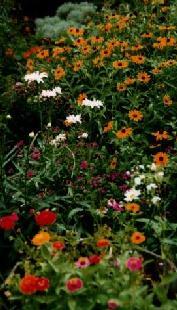 The gallardia mingle with coreopsis and nasturtiums. We love being surrounded by the garden!